Over the next few nights they’ll start to appear. 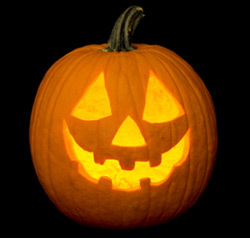 Pumpkins transformed into funny, spooky, or creative caricatures and shapes. It’s amazing what some people can do with the simple round shape of a pumpkin. Carving jack-o-lanters was a Halloween tradition in our house, and something I’m happy to continue to share with friends and family to this day. In an effort to help spur some creativity, I drummed up a few tips and tricks to make your slashing experience more fun this year! Pumpkin Masters is a thorough site dedicated to the jack-o-lantern legacy. It offers tips for every detail, from pumpkin selection to preserving your creation. A good suggestion, use petroleum jelly on the carved out artwork and spray it with water to keep it from drying out. Mentioned earlier, Pumpkin Carving 101 is another all encompassing resource for the art of carving your perfect pumpkin. It even includes suggestions for proper pumpkin burial. If you’re looking searching for something a little more unique this season, Better Homes and Gardens has an extensive list of free stencils you can download and print. And if you’re interested in a visual, Howdini has a step by step YouTube guide to gouging your gourd. Hot tip: try using a fork to poke your design outline into your pumpkin before carving away. I can’t wait to try this one. Hope these tips come in handy. Happy carving! A quick list of some of the fun events happening around our neighborhood this weekend. South Oceanside Elementary School will hold a fall carnival from 11 a.m. to 4 p.m. Oct. 30 at 1806 Horne St. The theme is ‘Insectival’ and the event will feature live music by Fundamental Vibes, a creepy ‘bug show’ that ends with a tantalizing ‘bug eating’ contest and a huge obstacle course. Enjoy food, crafts and games for the family. Wear costumes for the costume contest as you enjoy the tarantula terrarium and butterfly pavilion. Visit southo.oside.us or e-mail southofallcarnival@gmail.com. The FOFM Art Show and Sale featuring works by local artists will be held at 2305 Fire Mountain Road, Oceanside on Oct. 30th from 10 a.m. to 4 pm. Art includes acrylic and water color paintings, ceramics, photography, jewelry, wood carvings, and one-of-a-kind greeting cards. Proceeds in aid of The CHILDREN’S TUMOR FOUNDATION. The First Presbyterian Church of Oceanside will hold its 10th annual All Hallow Eve Celebration on Oct. 31, 2010 from 2 p.m. to 4 p.m. at 2001 El Camino Real, Oceanside, CA. “Over 500 people are expected to attend the event which will be held all over the campus,” says Gretchen Richardson, Director of Congregational Life for the church. Event is open to members and non-members of the church. Food, games, live music and lots of fun will be waiting for adults and children of all ages. Info: http://www.fpcoceanside.org. Phone: (760) 757-3560. October 31st New Venture Christian Fellowship’s 22nd Annual AutumnFest Celebration is set to be the best yet! FREE and open to the entire community, AutumnFest is a family-friendly alternative to Halloween. AutumnFest is a dynamic evening filled with music on three outdoor stages, offering an eclectic mix of food vendors such as Hunter Steakhouse, Ohana Hawaiian BBQ, local favorite Roberto’s Mexican Food and others. The night also includes plenty of thrills and outrageous rides, like the Zipper, a petting zoo for the kids, pony rides and more! Motocross Stunt riders will be performing their death-defying tricks – plus a special musical performance by chart-topping artists, The Katinas! There is sure to be something for everyone! Don’t forget the 3rd annual Art Show and sale showcasing the talents of your neighbors with proceeds going to TheChildrens Tumor Foundation. There are plenty of fun things to do around town this month. Below are a few focusing on the holidays this month. For additional events in town and around north county check out the calendar links. Details: Walk fundraiser. Halloween costumes encourage. Event sponsored by Community Interface Services. More information can be found at http://www.communityinterfaceservices.org. Public Information Number: (760) 729-3866. Details: Cultural festival, children’s activity area, altars, music, retail and food vendors, chalk cemetery, and gallery. Event sponsored by the Old Mission San Luis Rey. Public Information Number: (760) 757-9651. Details: Annual autumn festival sponsored by New Venture Christian Fellowship. Public Information Number: (760) 721-7777. Details: Paint your own Halloween pumpkin and listen to spine tingling tales. Free while supplies last. 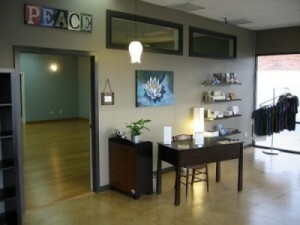 As Fire Mountain residents we have a great opportunity to enjoy yoga in a fun and inviting local studio. You can’t get any closer to home than Yoga Oceanside, located at 1830 Oceanside Boulevard in the Boney’s shopping center. Opened earlier this year, this earth-friendly space is 100% dedicated to the practice of Yoga. With a variety of classes offered seven days a week, there’s something for all levels. I personally have tried many of the classes with nearly all the instructors and while each has their own unique style, I’ve never been disappointed by a class. The best part about this studio is their welcoming attitude and the sense of community that is encouraged. If you’ve always wanted to give Yoga a try, October’s a great time. In addition to their Yoga Delight and Yin Yoga classes that are great for all levels, this month Yoga Oceanside has two $5 community classes offered Tuesdays at 5:30-6:45 p.m. and Fridays 10:30-11:45 a.m. These community classes feature a different emphasis but all levels are encouraged to attend. And since the single class drop in price is $14, for just five bucks this is a great chance to get on a mat and give it a shot. Other new student offers include a two-week unlimited yoga special for just $25. This is a great option if you have some free time on your hands and really want to try out the class varieties. Click here for a list of current classes and an online schedule. Still not convinced? Want to start with the basics? How about a free Introduction to Hatha Yoga class? On October 17 from noon to 1:15 p.m. instructor Marjorie Old will walk newbies through some of the fundamentals of yoga. This special class will include what to bring, what you can expect, and some basic poses. Yoga Oceanside is always offering unique workshops and events. In fact, this month they’re hosting two live music events. For more fun in October click here. Yoga might not be for everyone, but it has become a wonderful asset to my life and I have Yoga Oceanside to thank. There’s nothing pretentious or snobby about this studio, just a down to earth group of instructors who love what they do and genuinely want to share its benefits with their students. Hopefully these new student opportunities will encourage some of our friends and neighbors on Fire Mountain to try it out and join the growing community at Yoga Oceanside.